Has anyone seen June? It was just here, but now it’s gone! Patrick and I had a marvelous weekend in New York City, the highlight of which was seeing Hannah perform in her first cabaret. More on that in a future post. For today, here’s the start of Monkey Sock #2, heading east along southern Connecticut. It’s knitting up faster now that I’ve got the hang of the pattern. I still need to read each line of the 12-round repeats, but all I need is a glance. My knitting goal this week is to finish the Sunshine Coast sweater – just one sleeve to go. What’s up with you this week? Based on comments from my last post, there’s a lot of folks who’d like to see more of the Monkey Socks (or, given the state of my progress, the Monkey Sock). Socks are my go-to knitting project, especially when I’m traveling since they’re easy to stuff tuck into a bag. So a couple of weeks ago, as dear Jenn and I headed to Martha’s Vineyard for a quick visit to our sister-friend Kate, new owner of an awesome toy store on the island, I cast on a sock. While I’ve curbed my yarn-buying activity a fair bit recently, I make an exception for sock yarn. Unlike that scrumptious skein of DK weight merino or chunky baby alpaca, I know exactly what I’ll make with 400 yards of sock yarn. I love the almost neutral, subtle color changes in this luscious skein from Flying Finn Yarns. It called out for something other than my usual Good Plain Sock Recipe, so I searched for a pattern with some texture and detail. Monkey Socks (free from Knitty) caught my eye, with curves and weaves and a little bit of lace. Fear not, just a few yarn overs here and there. I like the addition of the twisted rib at the cuff — just to shake things up a bit from a traditional K1 P1 ribbing. I made the heel flap in Eye of Partridge instead of the plain stockinette called for in the pattern. The pattern continues all along the top of the foot until the toe. Good thing my feet were clean in this shot! As usual, I had to sit alone to graft the toe together with the Kitchener Stitch, quietly chanting the instructions to myself (knit front slip, purl front stay, purl back slip, knit back stay, repeat). One down, one to go. What are you making this weekend? OK, it’s been waaaaay more than a minute, but here we are. I’ve been traveling a lot for work and made good progress on Hannah’s throw (Siman Baby Blanket in Cascade 128 Superwash). But after a few square feet, I had to face the reality that it was getting too big to schlep about on the Metro and airplanes. Clearly, socks – the perfect travel companion – were needed. I dug out some lovely self-striping Felici from Knit Picks – colorway is Toucan. It felt great to be knitting a sock again! Part of what I love about making socks is the design and simple engineering of the thing. Although I’ve tried a couple at least one toe-up version, I prefer top-down. My go-to pattern is the Yarn Harlot’s Good Plain Sock Recipe. I’ve made more than a dozen pairs with it, and it never fails to please me — nor the recipient. Kevin got a pair for Christmas. Same yarn, different colorway. An added benefit of sock knitting? Totally portable, just about anywhere — for example, on a plane. It’s nice to be back. What’s on your needles these days? Now that I’ve got a sock project on my needles, I realize how much I enjoy knitting them. It took me ages to make my first pair — not to actually make them but to tackle the project. Looking back, I realize that all the features of socks that I loved in that first pair still hold true nearly six years later. You finish the top ribbing and it’s on to the leg. Before you have time to get bored with the rounds of stockinette (or whatever pattern you’ve chosen), it’s on to the heel flap. I’m partial to the Eye of Partridge stitch. Since learning new techniques or patterns is part of what makes knitting so enjoyable, I think I may try a new heel on my next pair. Maybe an After Thought Heel? 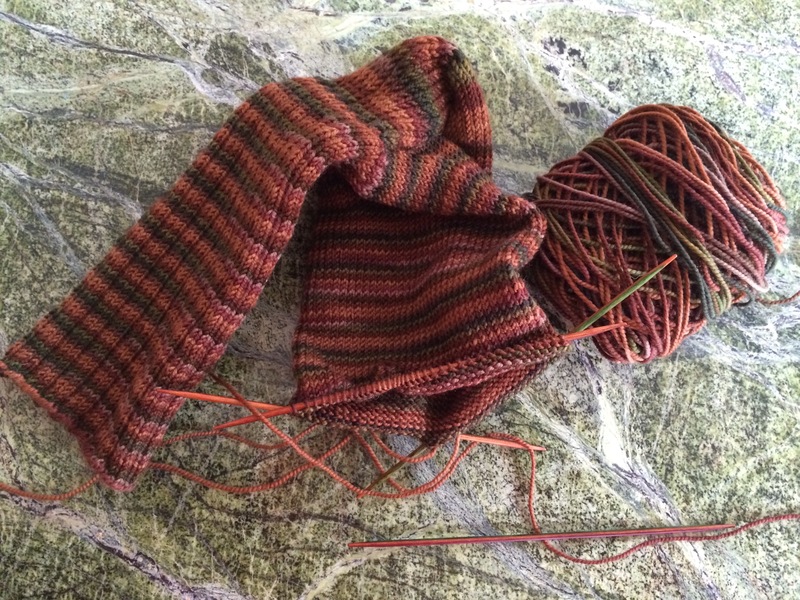 I like the idea of making a solid colored sock with a contrasting heel and toe. Plus anything created by knitting great Elizabeth Zimmerman must be worth a try. That’s for another day and another pair. This one — and it is only one at this point — will be my go-to Good, Plain Sock Recipe from the Yarn Harlot. Kevin, the intended recipient of this pair, has voiced texted his approval: “It looks great!! I like the colors.” It goes without saying that he’d like a pair rather than one, so I’d best cast on the next one lest I be hit with Second Sock Syndrome. Don’t laugh — it’s a thing. 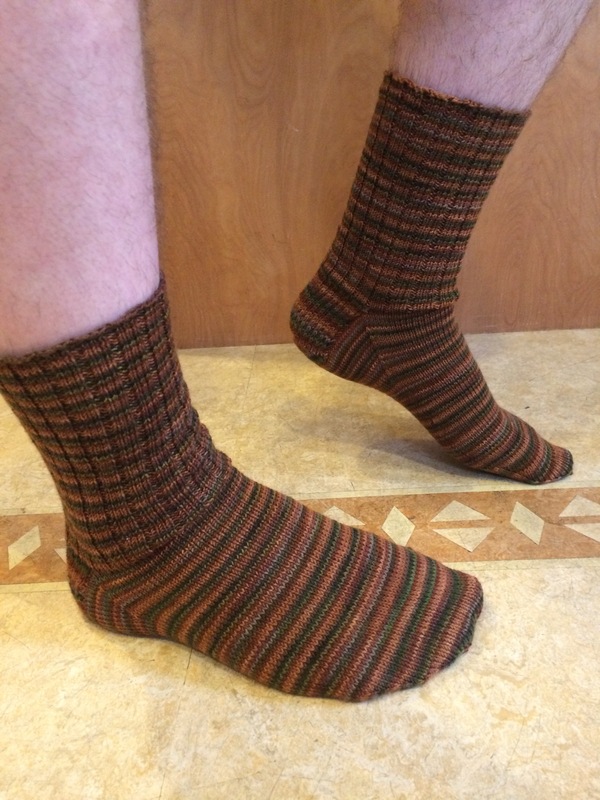 One of my knitting goals this year was to knit a pair of toe-up socks. I’m half-way there. A stretchy, soft self-striping yarn in blues and greens was the perfect combination for Kevin. (Plymouth Yarn’s Diversity in Deep Sea) He’s a big fan of handknit socks and those colors, so it was pretty much a no-brainer. In my excitement to start, I began in my usual top-down way using the YarnHarlot’s Good, Plain Sock Recipe. Only after I’d started to turn the heel did I recall my goal of learning to knit socks from the toe-up. The result was the sock on the right (Kevin’s left) — top down, partridge eye heel flap, gusset heel, and toe grafted via Kitchener stitch. Fortified with a toe-up sock book from the library (love, love, love the library! ), I started the second sock from the toe. The cast-on and toe shaping took a few extra minutes, but then I was on my way. No seam! I wasn’t thrilled with the heel flap — mostly because there wasn’t really a flap. But I carried on. I found a variety of heels in the toe-up book and expect I’ll try a different version next time. Kevin declared them “terrific and cozy,” high praise from a young man who’s pretty particular about his clothing. Before I’d ever knit a pair of socks, I wondered what the appeal was and whether anyone in my family would wear them. So naive! Turns out that hand knit socks are blissfully comfortable, as my three kids and sweet husband — and thousands of other people! — can attest. “I wouldn’t turn down a new pair of socks, Mom,” he said and glanced up from the basketball game he was watching. That’s all I needed. The socks traveled with us on a few days of college tours and information sessions — prime knitting opportunities! After we got home, I turned the heel, knit the foot, and shaped the toe. Yesterday morning — after my second cup of coffee and armed with the Kitchener instructions — I grafted the toe. Michael declared them fabulous and agreed to model. He even did a little New Sock Shuffle with his happy feet.